A conventional asymmetrical half-bridge (AHB) converter is one of the most promising topologies in low-to-medium power applications because of zero-voltage switching (ZVS) of all switches and small number of components. However, when the converter is designed taking a hold-up time into consideration, it has a large DC offset current in a transformer and a small transformer turns-ratio. To solve these problems, a new AHB converter with an integrated boost converter is proposed in this letter. 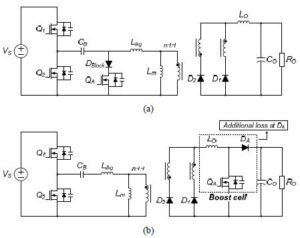 Because the proposed converter compensates for the hold-up time using the integrated boost converter without additional loss in the nominal state, it can achieve the optimized efficiency regardless of the hold-up time. The effectiveness and feasibility are verified with a 250-400V input and 45V/3.3A output prototype. Fig. 1. The conventional AHB converters. (a) DCS HB converter and (b) boost-cascaded AHB converter. Fig. 2. The proposed converter. In this letter, a boost-integrated AHB converter is proposed. The proposed converter integrates a boost converter in the rectifier in a new manner. Because the proposed converter can obtain an additional voltage gain during a hold-up time, it can be designed optimally in the nominal state regardless of the hold-up time requirement. Furthermore, since the proposed converter does not cause an additional loss in the nominal state, it can achieve the optimized efficiency. .J. 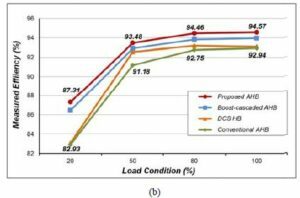 K. Han, J. W. Kim, Y. Jang, B. Kang, J. Choi, and G. W. Moon, “Efficiency Optimized Asymmetric Half-Bridge Converter with Hold-Up Time Compensation,” in Proc. IEEE Power Electron. Conf., pp.2254-2261, May, 2016. Wu, T. Mu, X. Gao, and Y. Xing, “A Secondary-Side Phase-Shift-Controlled LLC Resonant Converter With Reduced Conduction Loss at Normal Operation for Hold-Up Time Compensation Application,” IEEE Trans. Power Electron., vol. 30, no. 10, pp. 5352-5357, Oct. 2015. 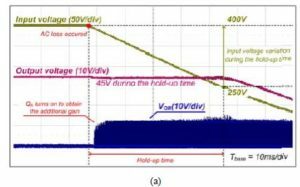 S. Lai, Z. J. Su, and W. S. Chen, “New Hybrid Control Technique to Improve Light Load Efficiency While Meeting the Hold-Up Time Requirement for Two-Stage Server Power,” IEEE Trans. Power Electron., vol. 29, no. 9, pp. 4763-4775, Sep. 2014.